Millie Messer has four young children and the mercantile to run. She posts an advertisement wanting a shopkeeper to marry. Clay Cutler is her choice. The trouble is he has two secrets. One is revealed when he steps off the train with his 5 children. Now she has 9. That’s what happens to Millie in the fourth book of the Multi-Author Silverpines Series newly released on Amazon. This series is a twist on the Mail Order Bride concept. Silverpines has had twin disasters happen which leads to most of the fathers, young husbands and eligible bachelors dying. The women are left with businesses to run and though strong women, they aren’t equipped for the task. Then there’s the BAD GUYS who come to town. What would you do? Here's how Millie reacted. The noise of the train slowing to a stop drowned out all thought. Abe covered his ears and frowned at her. He didn’t like loud noises. Millie bounced him slightly watching the conductor place the step on the platform. She held her breath as the man from the newspaper clipping stepped from the train. Clay Cutler glanced at her then turned back. He helped a cute little girl off. She had strawberry blonde hair tumbling in messy waves and a broad smile. She looked around with wide curious eyes that took in everything around her. She focused on Millie and her children and the smile widened. Two boys jumped down and pushed at each other before Mr. Cutler said a sharp word to them. One looked to be about Reuben’s age, the other slightly older. They each carried satchels. Reaching up, the man took a small girl from the arms of a young teenage boy and turned from the train. He looked at Millie and began to slowly cross the platform holding the toddler followed by the other four children. Millie gritted her teeth trying to keep the neutral expression on her face. He hadn’t said anything about about having children. And there were five. She nearly collapsed as the weight of the added members to her family crashed onto her shoulders. https://www.amazon.com/dp/B07BWZ4ZF3. Available on Kindle, KU, and print. Grab your copy today and see if the children can bring the family together or tear the new couple apart. Will evil intentions bring danger to any one in the family. The previously published books are all great reads. Be sure to get those too and find out how the disaster occurs. 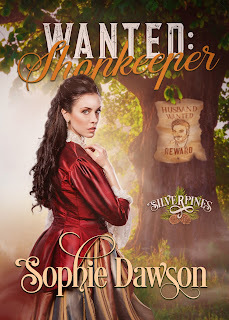 Silverpines Series. Hooray! Only One More Day! Medicine, We've Come a Long Way Baby! Early Birds & Night Owls-Come Join Us!